Earlier this month, SIFMA gathered the most influential voices shaping today’s capital markets to look ahead at what’s next for the markets and the industry. What struck me in the conversations taking place at SIFMA’s 2018 Annual Meeting was the recurring theme of significant changes expected in close proximity. Indeed, there is a confluence of revolutionary events coming that will fundamentally alter our markets and make the world look radically different in even just three short years. From Brexit to “no deal,” LIBOR to SOFR, fintech to finreg, here’s what we heard on the floor of The Capital Markets Conference. With less than 180 days until Brexit and just two years before the end of the transition period in 2020, the divorce between the EU and U.K. remains stormy. And, like any divorce, the primary parties are not the only ones involved. Huge implications for the capital markets and third-party relationships – including those between the U.S. and the U.K. and EU – are becoming real. Can a deal be reached in time? 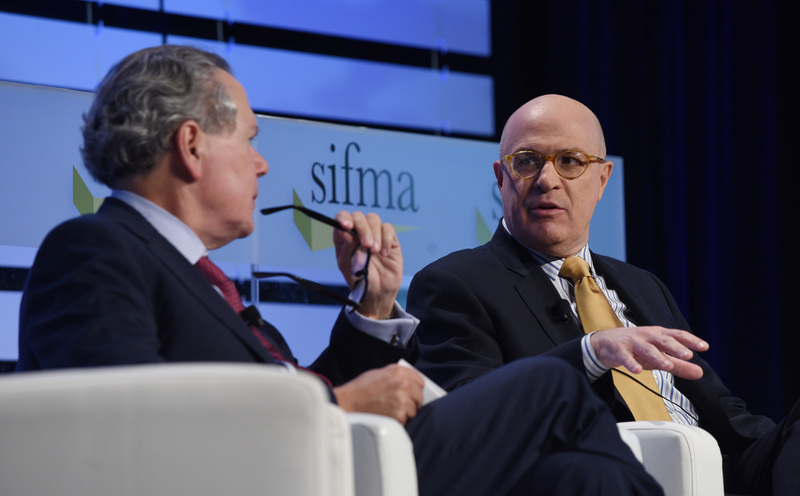 CFTC Chairman Giancarlo discusses the “next act” for cross-border financial regulation with SIFMA’s Bentsen. It is estimated that $200 trillion of financial contracts and securities are tied to LIBOR – a widely-used benchmark for short-term interest rates – and that matters to everyone. LIBOR is one of the most widely-embedded aspects of the financial markets and the transition from it and other IBORs to more robust alternative risk-free rates (RFRs) supported by larger, observable markets is a massive undertaking. Financial Conduct Authority (FCA) Chair Andrew Bailey “put a line in the sand,” said JPMorgan’s Sandie O’Connor, when he said he would not compel institutions to continue to submit contributions to the benchmark past 2021. After that point, there is a risk that the production of LIBOR could cease. By laying the foundation to transition away from the use of LIBOR, identifying and trading new risk-free rates, improving our fallbacks in derivatives and new securities transactions, and implementing other elements of the Alternative Reference Rate Committee’s (ARRC) paced transition plan, we are reducing financial stability risk in our markets and making the financial system more resilient. While the timelines for Brexit and the transition away from LIBOR are daunting but achievable, the pace of change in technology is rapid and relentless. The intersection of financial technologies and traditional business models is transformational: financial institutions are analyzing the use of fintech solutions to enhance client service, increase efficiencies in the back office, meet regulatory reporting requirements and more. RegTech, Robotics Processing Automation (RPA), machine learning, responsible AI – it is impossible to overstate the scale of transformation. Regulators and market participants are increasingly collaborating through sandbox environments to promote responsible innovation, but cybersecurity remains “job one” for regulators and a c-suite priority for financial institutions. While we are all working toward the same end, work remains to ensure duplicative or conflicting regulations do not deplete resources that otherwise could be put towards preventing the next cyber attack. The proliferation of cybersecurity regulations accompanies the unprecedented volume of new financial regulations adopted since the financial crisis. Covering everything from market structure to capital standards, an exceedingly complex regulatory landscape is further complicated by multiple jurisdictional regulators adopting the same rule with different interpretations and views on implementation. Much is made today about “deregulation.” To be clear, the financial industry is not in favor of deregulation. However, we do think it is necessary to step back and review the resulting rule set – much of it emanating from the Dodd-Frank Act – to determine where conflicting, overlapping or duplicative regulations might be harmonized. Without recalibration, we risk market fragmentation, inefficiency and the very financial instability that regulation seeks to prevent. An example of thoughtful consideration of the current regulatory environment, at our conference CFTC Chairman Giancarlo discussed his recent white paper on cross-border regulation. He argues the CFTC’s current approach “has fragmented what were once global markets into a series of separate liquidity pools.” While we are still evaluating the details, Cross-Border Swaps Regulation Version 2.0 is an honest, forward-looking assessment and a model to follow. Notable progress has also been made, for instance, in the proposal of a best interest standard under the SEC and coordination of the multiple Volcker Rule regulators. We are also seeing promising signs of coordination between bank and markets regulators. However, the gold-plating of international capital and liquidity standards remains a significant issue. While banks are healthier, how much stronger could the economy be if they had the flexibility to release more capital and liquidity into the economy? While the industry is being transformed, so are the demographics of our society. Throughout the conference, business leaders asked: how can we promote diversity, inclusion and parity to shape the future of our workforce? Financial institutions are investing heavily in recruiting and retention, early-stage training and mid-career reskilling. This remains one of our toughest challenges ahead, as does addressing another gap: financial literacy. In a conversation on the main-stage, Chuck Schwab and Lisa Kidd Hunt called for mandatory in-school programs and more parental involvement. “It was mandatory in high school that I take home-ec,” said Hunt. “So I could sew an apron and make a biscuit. But I had no idea about checking accounts, credit cards and all those things that might serve me better. While I can still make biscuits, I think by now we should have made much more progress on financial literacy in the United States.” The SIFMA Foundation is among those making a difference for our younger generations – the Schwab Foundation is a generous underwriter of our Capitol Hill Challenge – but much more work remains. We don’t know how many of these scenarios will play out yet, but our industry and the markets have always been quick to adapt and I am bullish on the future. No other country’s markets come close to the depth and efficiency of ours, as evidenced by the size of our gross domestic product, the strength of our commercial sector, our levels of homeownership, and our vast national infrastructure. But we’re a global business and this is a global age. The most important thing we do is bring credit and capital to the economy. “The clients are why we are here,” said our incoming board chair Jim Allen of Hilliard Lyons. By looking ahead just three short years, we can avoid market fragmentation, prevent financial instability, and continue servicing our clients and powering the global economy. For more, I urge you to read the 2018 Annual Meeting Debrief by SIFMA Insights and watch this fireside chat with our leadership about SIFMA’s priorities on behalf of the industry. Kenneth E. Bentsen, Jr. is president and CEO of SIFMA and Chairman of Engage China. He is a former investment banker and Member of Congress, and has also served as CEO of the Global Financial Markets Association (GFMA), SIFMA’s global affiliate.